SINN Féin Councillor Stephen Burns has said that fly-posting on the old Co-op building at Upper Square in Castlewellan is becoming an eyesore in the town. He said: “The fly posting has become more and more frequent, and posters have been left up for a considerable amount time. Concerned about flyposting in the area. 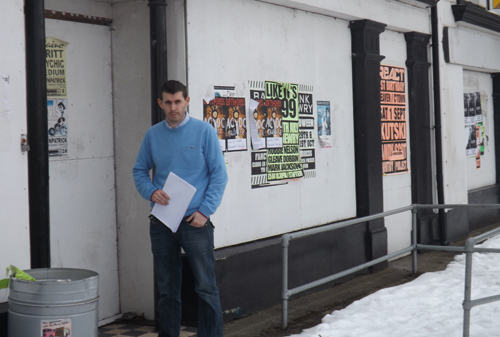 Councillor Stephen Burns outside the vacant Co-op building in Castlewellan looks over some of the posters on display.